While you may be over the moon when preparing your NYC move, it’s important to adjust your expectations. Unless you base your budget on realistic income and expenditure numbers, you won’t be able to conclude your apartment hunting process successfully. Although relocating to a chaotic city like New York brings incredible possibilities for professional and personal growth, it’s always fraught with certain compromises and sacrifices. But, one thing is for sure: if you are moving on a tight budget, you are likely to compromise either on price or square footage/distance. When moving to a NYC apartment, chances are that you will be downsizing. Transitioning to a micro apartment will introduce you to certain challenges as well as lifestyle adjustments. In order to move to the neighborhood you’ve always wanted, you may need to settle for a tiny, but reasonably priced NYC apartment. While the perks of starting over in a big and busy city are obvious, there are some less appealing aspects of it. As it turns out, many NYC newbies are likely to end up in a walk-up apartment in exchange for a convenient location. Typically those apartments are more affordable, which is why many graduate students opt for moving into a walk-up apartment with a couple of roommates. 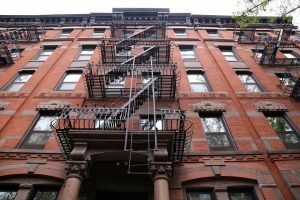 When it comes to relocating to a walk up NYC apartment, a series of common concerns and worries involved as well as daunting moving activities should not be taken for granted during the relocation process. However, the good news is that with a little extra planning, you can have a smooth moving experience (as smooth as a move can be). Relocating your earthly possessions into a building without an elevator by taking multiple trips up and down the stairs brings a whole new set of challenges. If moving into a walk-up apartment is not a major deal-breaker for you, we will gladly highlight some of the potential advantages. While the mere thought of relocating to a walk-up apartment may induce feelings of panic and distress, try to focus on the bright side. Eventually, you may realize that moving to a walk-up isn’t all bad. – As a rule of thumb, the higher the apartment is located, the less you get to pay. While walk-up apartments are considered a budget-friendly solution in the long run, you might need to set aside a significant amount of money for the moving day. 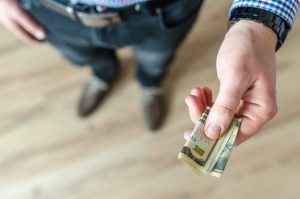 If the place has been on the market for a while, you may be able to negotiate with the landlord in order to lower the final price. 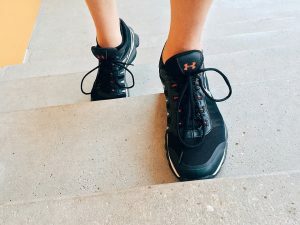 -Everyday stair-climbing, especially with large shopping bags is a perfect cardio workout that will make you forget about your monthly gym membership. Even during lazy, winter months you will be able to burn a lot of calories, enhance your exercise routine and fight obesity. While some people find this aspect demoralizing, others may consider it as a challenge they are willing to accept. -Safety is one of the biggest concerns for most apartment hunters. As you don’t need bars on the windows and burglars usually avoid the apartments situated on the higher floors, you will be out of harm’s way. -When living in a top-floor apartment, there’s also a chance of getting more light and less street noise in comparison with lower floors. – Higher floors offer a better view. Some people find a breathtaking view and scenery worth the effort of climbing the stairs every day. Let’s face it – moving your possessions up and down the flights of stairs is a strenuous and exhausting task. Make sure one of the tasks on your moving checklist is to enlist your friends’ help. Under no circumstances should a household move be considered a one-man job. No matter how small your moving load is, never try to move it alone to a walk-up apartment. 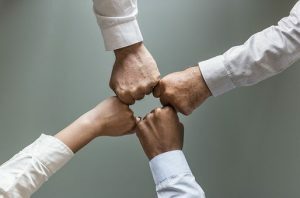 Reach out for help at the earliest stage of the moving preparation process so as to ensure your volunteers are available for the day of the move. Explain the nature of the task so that that can dress accordingly and bring suitable equipment. However, if your new NYC apartment is situated on a higher floor, chances are that your friends alone won’t be up to the task. No matter how physically prepared they are, the lack of moving experience and proper technique may lead to serious health issues and injuries. Instead of asking them for help, gather your friends for a housewarming party to celebrate your new beginning when the move is over. On the other hand, quality and affordable movers may make the entire relocation a lot simpler. Whether you are moving across town or to another state, professional moving assistance can make a difference between a disastrous and a smooth moving experience. Evaluating and picking the right moving company is a time-consuming task, but once you complete it successfully, you’ll free up time for other important activities. The right equipment, know-how and relevant experience are necessary prerequisites for a successful move that only properly trained movers can offer. Therefore, take your time to assess your needs as well as moving estimates and decide which option suits you best. Reputable moving companies will go above and beyond to meet your unique requirements and make the entire process easier on you. Tipping your movers is just one way to show your gratitude and appreciation for your moving crew’s efforts. Also, make sure to keep your movers’ spirits high throughout the moving day by offering refreshments, snacks, lunch. Having friends around on moving day can add a fun touch to a grueling relocating process. If you are moving to another state, you might want to make the most of your gathering, since you won’t be seeing your friends that often.